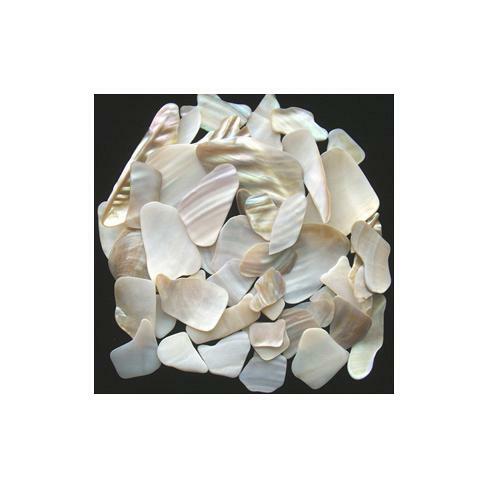 LUMINOUS WHITE MOTHER OF PEARL SHELLS. YOU WILL RECEIVE A VARIETY OF SIZES FROM 1/2" TO 2" PIECES. 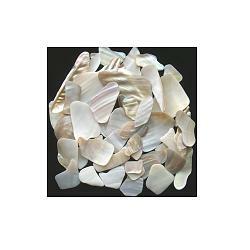 HELPFUL TIP: IF YOU FIND YOU NEED TO CUT SOME OF THE SHELLS FOR YOUR PROJECT, TRY USING A PAIR OF VERY SHARP SCISSORS INSTEAD OF YOUR MOSAIC NIPPERS. IT WILL DO A MUCH BETTER JOB ON THE THINNER SHELLS THAN THE NIPPERS. AVAILABLE IN: 1/4LB., 1/2 LB. AND 1 LB. QUANTITIES. THE MORE YOU BUY, THE MORE YOU SAVE! NOTE: Please wear a mask or respirator when cutting or grinding paua/abalone shell. The dust created from grinding and cutting can be toxic if it gets into your lungs. We have disposable N95 rated masks for sale in the Tools section.